Athens, Ga. — Although the Great Recession has hit Hispanics and Asians particularly hard, their buying power is expected to grow rapidly over the next several years, according to the annual minority buying power report released today by the Selig Center for Economic Growth at the University of Georgia Terry College of Business. The percentage gains in buying power over the past decade have varied considerably by race and ethnicity: 108 percent for Hispanics; 98 percent for Asians. The buying power of Hispanics will rise from $1 trillion in 2010 to $1.5 trillion in 2015, accounting for nearly 11 percent of the nation’s total buying power. The report defines buying power as disposable income, or money that is available for spending after taxes. Humphreys said the report provides businesses with a valuable planning tool for judging start–up or expansion opportunities and for tailoring advertising, products and media to individual market segments. “The Hispanic market alone, at $1 trillion, is larger than the entire economies of all but 14 countries in the world–smaller than the GDP of Canada but larger than the GDP of Indonesia,” Humphreys notes. Hispanic buying power is expected to grow 50 percent in the next five years, from $1 trillion in 2010 to $1.5 trillion in 2015. 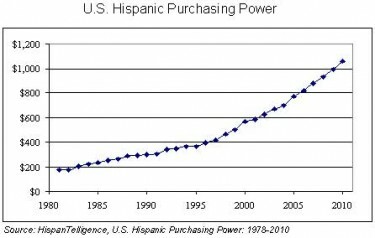 The report notes that the rate of growth in Hispanic buying power tops all other racial and ethnic groups as well as the rate of growth in overall buying power. Favorable demographic forces are primarily responsible for the anticipated growth in Hispanic buying power, Humphreys notes. Population growth is expected to continue, and the relatively young Hispanic population means that proportionally more young Hispanics are starting their careers and moving up their career ladders. Increased entrepreneurial activity and a rising level of educational attainment also illustrate the upward mobility of Hispanics, the report finds. 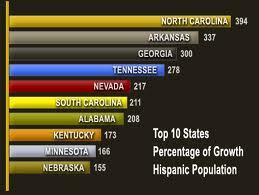 The ten states with the largest Hispanic markets, in order, are California ($265 billion), Texas ($176 billion), Florida ($107 billion), New York ($81 billion), Illinois ($44 billion), New Jersey ($39 billion), Arizona ($34 billion), Colorado ($22 billion), New Mexico ($20 billion), and Georgia ($17 billion). The top ten states, as ranked by the rate of growth of Hispanic buying power over the past decade, are South Dakota (253 percent), North Dakota (237 percent), Arkansas (229 percent), Alabama (228 percent), South Carolina (226 percent), Maine (222 percent), Tennessee (220 percent), West Virginia (211 percent), Mississippi (206 percent), and Maryland (204 percent).